Oh Behave! 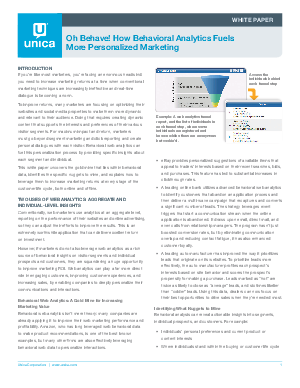 How Behavioral Analytics Fuels More Personalized Marketing. This FREE report reveals how you can turn web analytics into a powerful enabler of Interactive Marketing. Included is a five-step migration path to Interactive Marketing success. Uncover the gold mine that lies within behavioral data, identify the specific nuggets to mine, and explain how to leverage them to increase your marketing return at every stage of the customer life cycle- both online and offline.